Olive stays for a few days at Kárastadir. She sees no other visitors and wonders if maybe hardly any visitors come. However, she is told that she is early in the season and, soon, the Germans, Danes and Americans would start arriving. They´d do the usual round of Geyser, Gullfoss and Thingvella, then go home. Hearing that, she decides that she should visit Gullfoss and Geyser before the tourist hoards arrive. The distance is 70 miles. She´ll have to make the trip by horse. Her guide, to her dismay at first, is the farmer´s thirteen year old son. It´s been arranged for them to stop overnight at a farm thirty miles away. The day starts out fine but soon turns to drenching rain. (Sound familiar?) It’s obvious Olive isn’t all that impressed by Geyser. She’s more concerned that it is five o’clock and she hasn’t had anything to eat since breakfast at 8:30. She and Sigurdur stop at a farm and the farmer’s young wife provides them with “delicious home-made biscuits and little cakes”. 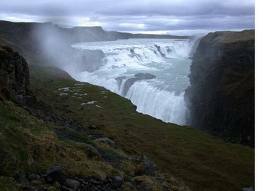 They reach Gullfoss. Both she and Sigurdur are overawed by the falls. They stay at a different farm house on the way back. Olive has a bit of an adventure because the farmer’s wife goes with them. She is herding six horses. Olive gets to ride one and they all race together over some moorland. The farm wife’s destination is a spot where some labourers are working. Olive has lunch with them, tries out some Icelandic words and one of the labourers tries some English. The kindness of Icelandic hosts is mentioned time and again in travel accounts that span more than a hundred years. That kindness is well captured b Olive‘s last words about her stay at Kárastadir. This entry was posted in Uncategorized and tagged Gullfoss, hospitality, Iceland, Karastadir, Thingvella, tourists by william. Bookmark the permalink.